Action, love, and an incredible legend of faith. Israel is at war. Dov Zalinski is desperate to meet up with his long-lost mother, sick and held in Cyprus. He makes a bold venture out of Jerusalem to try to find his way there, but is halted by events that refuse to let him leave. Emily Parkinson, on the other hand, is worried: Jerusalem is going hungry, twelve orphans she cares about are among them, and Dov might be harmed outside of Jerusalem. And then there's that odd duck that they end up traveling with to Kibbutz Yad Shalom. Dov has something of a character relapse, but slowly regains what he's learned in the past five books. He still struggles with what he wants and what is right. When a boy at the kibbutz saves Dov's life, Dov wishes he could trade places with him. Emily does something a bit too drastic to try to keep Dov from leaving, but she wishes she hadn't done it and apologizes. She's concerned for the orphans and does what she can for them. Emily's aunt and uncle, as well as a Scottish couple, encourage Dov and Emily by reminding them that it was a good thing they rescued the orphans. 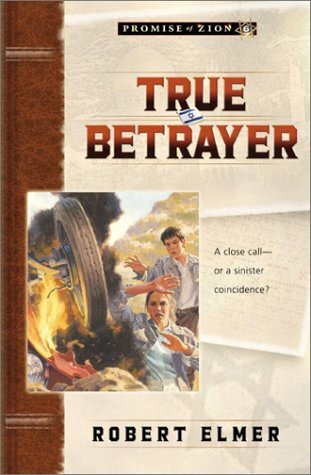 It's a little confusing trying to tell if the characters are betrayed or if the action was seen as being for the best. Some people at the kibbutz, Emily, her aunt and uncle, and a Scottish couple are firm believers in God and they try to reach out to Dov. A Christian service is held in a church. Dov, again, has something of a relapse, wondering and doubting instead of praying and trusting. He feels a bit annoyed by all this Christianity stuff and thinks that he would be a traitor if he became a Christian. At one point though, things click and send him thinking. At one point, he prays long and hard for someone else - a thing he'd never done before. A brief, but very real, explanation of the Gospel is presented. Trust in God is a crucial component of the story. A bar mitzvah - complete with reading from Isaiah - is celebrated. Arabs outside of Jerusalem are "trigger-happy". They shoot at a car (no one is hurt). A car crashes, throwing its driver out, and turns into a fireball. A well is tampered with. There is brief talk of putting a dog down (it doesn't happen). One man threatens to shoot a dog (he doesn't go through with it). The kibbutz is bombed, resulting in two deaths, one serious injury, and a big mess. The kibbutz is later burned (sans inhabitants). The traitor explains his whole plan of operation to Dov. Dov momentarily suspects a man of maybe possessing liquor (he dismisses the idea and it turns out to be wrong anyway). This is the final installment of the Promise of Zion series and it finishes strong. The series not only provides entertainment, but some post-WWII history of Israel and strong Christian values that do not come across as overbearing. Again, check out the what's-true-what's-not section at the end of the book as well as listed resources for further enjoyment and education.